Rip Currents | Capt Tony's "Walkingangler.com"
Rip currents are typically not a safety concern for the angler fishing on the surf. Most anglers use them to locate sloughs and ambush spots for feeding fish. But occasionally and when wading in the surf, an angler can get too far into the waves and be caught in the outward flow of a rip current. This momentary loss of balance and control can result in being swept out into the ocean. 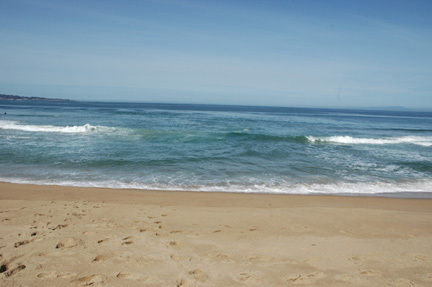 Before fishing on the surf, you should survey the beach and wave action. Make sure you are completely aware of the “danger zones”. And stay clear of them. The most significant danger comes when an angler is wearing waders. 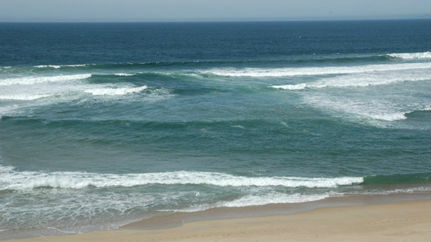 A single wave can catch you off guard and tumble you into the wash and possibly into the rip current. Safety should be of paramount certain when fishing on the surf especially when wearing waders. Wade only up to your knees. Allow the frequent wave to only splash up to your waist, never over the belt line. You should limit the depth of water you stand to allow for you stability and balance. Use extreme caution when fishing on the surf. I have attached a diagram of a rip current and several photos of various wave configurations to help you recognize rip currents and danger zones.